For many cities, widening roads and building more flyovers can be a solution to traffic congestion. However, from the pedestrians’ point of view, it can lead to less walking space and missing links between buildings. When the Seoullo 7017 opened in Seoul last year, Mayor Park Won-soon’s goal was clear: making the city “more walkable” by creating bike paths, pedestrian-only roads and redesigned sidewalks to make them more pedestrian-friendly, all ways to reduce vehicle traffic. 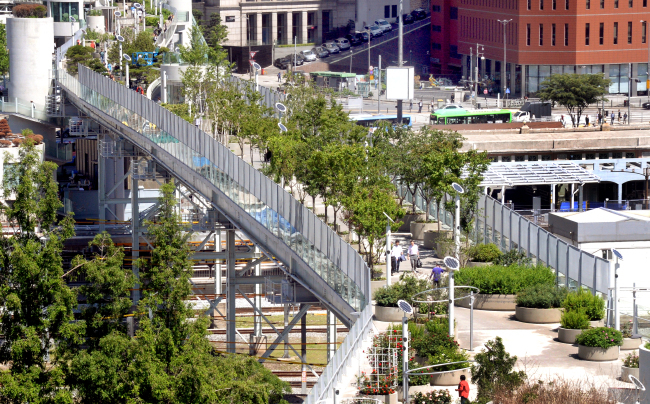 The former Seoul Station overpass that was slated for demolition and closed to traffic in November 2015, has been transformed into a footbridge where people can walk high above the maddening traffic below. 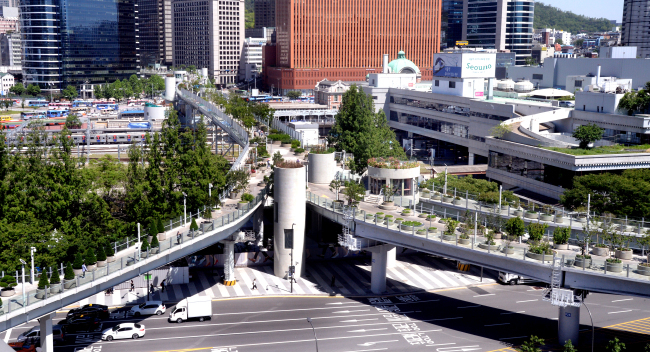 The idea of repurposing the condemned flyover, which is part of Seoul’s urban regeneration projects, has been welcomed by pedestrians, according to the city’s data. Seoul Institute’s survey shows that the overall satisfaction of domestic visitors to Seoullo was 5.49 out of 7. The respondents said they visited the overpass usually to take a rest and a walk, or enjoy the views of downtown Seoul. The places they visited before or after visiting the Seoullo included Namdaemun Market (38.6 percent) and Seoul Station (23.9 percent). Since it opened on May 20, 2017, the kilometer-long elevated pedestrian park has seen more than 10 million visitors, according to the city. Modeled on New York’s High Line, it features over 13,000 trees, shrubs and flowers in cylindrical planters that light up blue at night. An average of 30,000 people visited the elevated pedestrian road on weekends, and 20,000 on weekdays over the past year, the data shows. Among them, about two million were foreigners -- Asian countries accounted for the most: Taiwan (18 percent), Japan (13 percent) and Hong Kong (10 percent), followed by the United States (10 percent), Canada (3 percent) and France (3 percent). 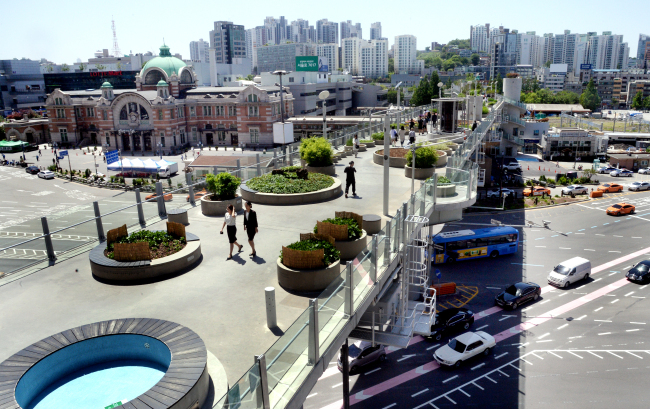 The walkway also serves to connect Namdaemun Market, the oldest and largest traditional market here, and nearby buildings, enhancing both commercial and social activities, according to pedestrians and merchants in the area. “When the old overpass was closed to traffic last year, I saw more congestion, I heard more noise on the roads. Now, it seems people prefer walking to driving,” Kim Ock-ja, 64, who have been selling clothes on a roadside cart near Namdaemun Market for 15 years, told The Korea Herald. Lee Hye-in, 54, who works as a waitress at a nearby dumpling eatery agrees that their market is seeing an increasing number of both domestic and foreign visitors. “The Seollo is a good example that makes us realize just how little space walkers are allowed to inhabit in the car-oriented city of Seoul. For decades, we took it for granted that roads are only for vehicles, when at least some of them should be reserved for pedestrians as well,” said Lee, who said her restaurant’s sales have risen substantially. The city said the number of visitors to Namdaemun market has increased by 20 percent since the opening of Seoullo. Over 63 percent of Seoul Institute’s survey respondents who are merchants and local residents answered positively about the pedestrian overpass, especially in terms of increased visitors, increased real-estate prices and convenience of moving between nearby areas on foot. In addition, Seoul has held a total of 1,305 festivals and events on Seoullo with the help of businesses, universities and merchants to revitalize other local industries. Trees and flowers planted on the one kilometer-long park that serves as a “mini-forest” above downtown car roads also help reduce the city’s worsening air pollution, according to experts. “It’s simple: more room for pedestrians and bikes create more congestion on roads that will become unmanageable as population grows,” Kim Hyun-chul, the 50-year-old taxi driver, said. “People are still clinging to their automobiles, and it’s already a traffic hell in Jongno-gu areas. If the city wants to avoid congestion during rush hour, they have to build more flyovers and widen the roads, not close them,” Kim said. Regarding the increased congestion, Seoul officials said the situation will improve by reorganizing public transportation routes and traffic signal systems, and, most importantly, by changing the minds of the citizens. Candidates running against Mayor Park in next month’s local elections have taken swipes at the Seoullo 7017. Former presidential hopeful Ahn Cheol-soo of the minor Bareunmirae Party grilled Park on the “waste of taxpayer’s money” when he visited the pedestrian overpass past month. “(The overpass’) annual maintenance cost is said to hover around 4.32 billion won ($ 4 million), which is about the same as the cleaning expenses for subway stations in a city that 3 billion people use every year,” Ahn told reporters. “The garden park reminds me of the ancient hanging gardens of Babylon that fell away,” Ahn added. Another mayoral hopeful and former Gyeonggi Province Gov. Kim Moon-soo of the main opposition Liberty Korea Party said he would “demolish it” when he is elected.